City of Gold. 2010. Acrylic and pastel on panel. 24 x 48 in. This piece was begun in college, and only finished years later, in 2010. The woman is Jerusalem, which, I’m told, literally means “Possession of Peace”. Rather than making any statements about the physical city, I’m using it for a symbol of all who seek peace. Shalott. 2010. Acrylic and pastel on panel. 48 x 24 in. Tennyson’s account of the Lady of Shalott sees her forbidden by a curse from leaving her weaving loom. Overtaken by curiosity at the sight, reflected in a mirror, of the knight Lancelot passing by, she flies to the window to look. Her curse now realized, makes her way to Camelot by boat, singing as she dies. This image serves as another picture of death and rebirth, or of a transition from one phase to another. Madonna of the Asteroids. 2010. Acrylic and pastel on panel. 48 x 24 in. This work depicts the mother of Jesus suspended in space in a fantasy realm. The figure of Mary was used here to embody or serve as a metaphor for God. Thinking of the patriarchal history of many religions, I wanted to show a deity as both and neither male nor female, and gender as just a means by which we relate to the spiritual realm. Ophelia. 2010. Acrylic and pastel on panel. 72 x 24 in. This painting depicts the Shakespearean character’s drowning as a symbol of spiritual death leading to rebirth. The role of water shown here parallels a mikvah or baptism. Flannery O’Connor’s short story “The River” was also an influence. Trinity. 2012. Acrylic and pastel on panel. 36 x 48 in. Two geese and a wounded person are seen lying in a road. I’ve heard that if a goose flying in formation with its gaggle is shot or wounded, two other geese will leave the group to stay with the fallen bird. They care for the animal until it either dies or heals. 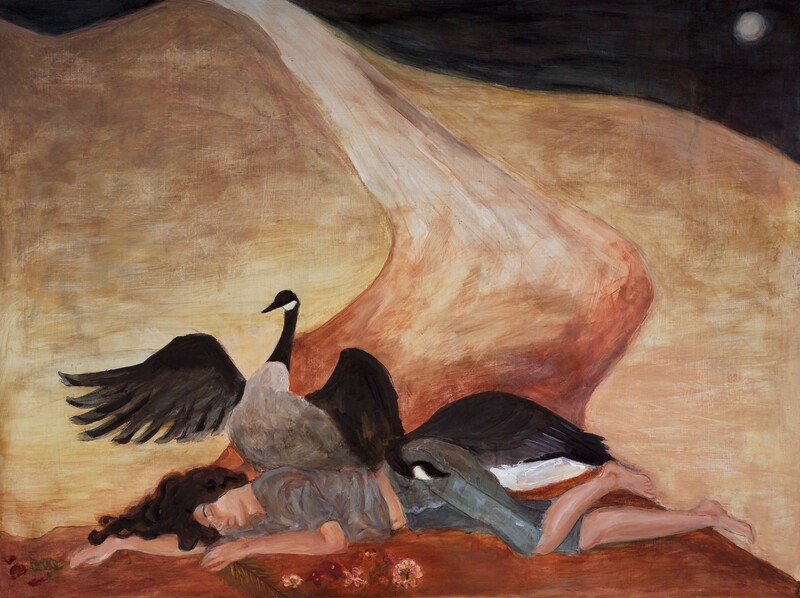 In this case, the woman represents a messiah-like figure, cared for by two geese to form a trinity of sorts as she lays dying in the roadway.